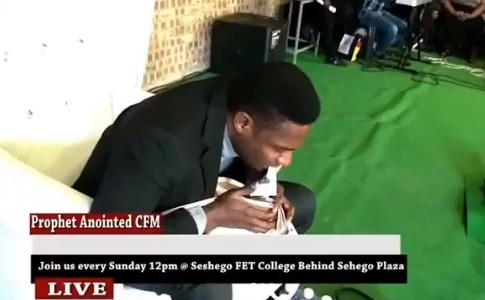 Saturday, September 15, 2018 - A pastor shocked his congregants after he vomited “miracle money” in church during a Miracle Service. According to the controversial pastor, he saw a lady who was in desperate need for money when he was preaching. He told her to empty her handbag and bring it to the pulpit. The pastor then told his congregants to confirm if the handbag was empty before he started performing the miracle. After they confirmed it was empty, the pastor sat down and prayed. After prayers, the money started coming out of his mouth. “Last Sunday as i was preaching at the church here in Limpopo, I came across a lady and I saw how so desperately she needed money.